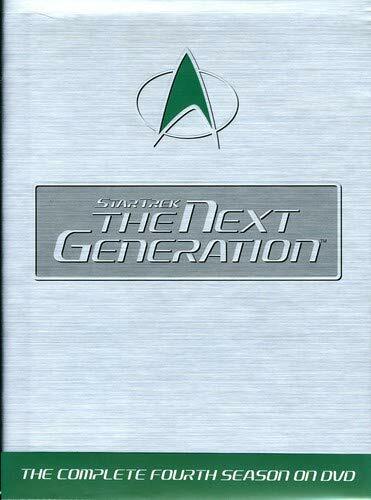 Season 4 of Star Trek: The Next Generation seemed like the year of family. After quickly resolving the breathtaking cliffhanger of "The Best of Both Worlds," the show took pains to show some of what the Federation was fighting for. We meet Picard's brother, Data's father, Tasha's sister, and Worf's adoptive human parents, plus an old flame with a surprise son in tow. The Klingon heritage subplot that begins here and builds to the cliffhanger finale ("Redemption") would continue to the show's end and through into Worf's reappearance in Deep Space Nine. The year also explored the implications of Data, Lwaxana Troi, Geordi, and Dr. Crusher being in love, while Miles O'Brien (given a first name at last) married Keiko. There were old friends revisited: the ubiquitous Q in a hilarious Robin Hood romp ("Qpid"), perennial screwup Reg Barclay ("Nth Degree"), and even the mysterious Traveler from season 1's "Where No One Has Gone Before" (played by Eric Menyuk, who was nearly cast as Data). There were new races introduced who would have an important bearing on Trek's destiny: the Cardassians and the Trill. Most of all, though, there were the one-off stories that impressed: "Clues," with its memory-loss mystery; "Night Terrors," with some genuine frights; and "Identity Crisis," with possibly the only time Trek technology really helped Geordi solve a puzzle. Then right at the end, reinforcing the year's familial theme, Denise Crosby returned as her own half-Romulan daughter! Last edited by cb5454 on Sun Apr 23, 2006 10:21 am, edited 5 times in total. These can't be all....... can it?? Thanks, looks like I've got a huge amount to download - it'll probably take the whole next year to get the four seasons that have been released. They apparently began releasing season 5 as well, the first links can be found via the eMule search. I wouldn't trust those on the search at the moment. oops stand corrected all the 1 gb vobs have got loads of full sources now. I'll dig out my old ones. Gimme a day or two to sort my share out. did you find the old files for resharing? I've got them all shared. Are you downloading all at once? I've found with these that the trick to getting them is, unfortunately, to do them one at a time. It takes a while but you get there. I've got them all as downloading but I use stacked sources which will stack all the possible sources on one file at a time. I don't see you as a source yet - I do see you on my upload queue if that's you (at least it's your nick). My nick is [FIN]Boulder. Probably a tall order as its such a long time ago, but anyone still sharing these? Well trying to get the 4th and the 5th Season is very hard. Almost no complete sources, so I have to ask for resharing this and perhaps the next season, please.